A traditional Lao wedding is often celebrated at the bride’s house which takes place in the morning or afternoon. 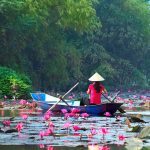 In the past it was always held in the morning because the ancient Laos people believed that it was the best time for a joyful. However, in the modern life, the convenience is appreciated and the time doesn’t really matter any more. Witness a traditional wedding will highlight your Laos vacation. The wedding starts with a ritual called sou khor in Laotian, it means bride-price negotiation. The bride-price is usually money and gold or anything valuable. In tradition, the bride’s parents ask this as a refund for bearing and bringing up until she grows. The amount depends on the family status of both sides. Nowadays many parents don’t ask for anything, they only hope their daughter to be happy. When two families finish the negotiation and choose the bride-price as well as all other problems, they set the wedding date. Normally, the wedding date is on a good day in lunar calendar. 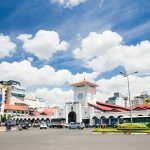 Also, the parents usually ask for advice of elders, senior or monks, who have good knowledge of Laos custom and tradition. In particular, weddings are not permitted to hold in three months of khao phansa because this is the Buddhist Lent which happens on about from late July to late October. However, nowadays, this ritual has partly changed to suit modern society. Sometimes couples set the date to suit their busy lives. At the night before the wedding, a cozy ceremony is held at both the groom and the bride’s house called oun dong that means marriage warming. It is almost that only close relatives and friends come to help to prepare the wedding as well as to enjoy the dear meal. 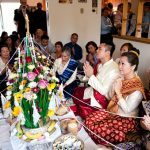 They prepare pha khuon – the handmade marigold pyramid made of banana leaves, food for the following important day and the the bedroom of the new couple. The bed room has to be prepared by the bride’s mother or an older woman who has a happy family. On the official day, the bride wears sinh – the traditional Laos dress for ladies and silk blouse, her hair is made it a bun behind in a beautiful and special way with gold decoration. Besides, the bride also brings a gold necklace, bracelets, earrings and a bell. The groom also gets dressed up with white silk shirt and a traditional silk salong (the traditional costume for men). Today, sometimes grooms wear casual pants for comfortable. In tradition, a small baci (basi) or sou khuan ceremony is carried out in both the bride and the groom’s houses before the official wedding happens. 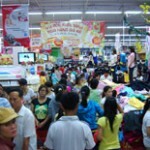 Now many families skip this custom, especially in cities where Lao traditions are being eroded. When the baci finishes, a convoy of the groom go to the bride’s house, bringing the bride-price. The procession includes some old men and women, who are know a lot about Lao customs and traditions, they are often the groom’s parents and respected seniors. Reaching the bride’s house, the leader will say something like “we come with horses, buffaloes, cows, a pile of silver and gold to give to you in exchange…” or something like that. While this exchange is taking place, the people in the convoy waits somewhere nearby. After that, the convoy enters the bride’s home, playing musical instruments, singing and dancing on the way. Everyone is happy and laugh joyfully. The groom steps under an umbrella that is brought by a man, maybe his friend. It is very fun to witness this ceremony in Cambodia. It is called hae keuy. The bride’s family will greet the convoy at a silver door and a gold door. They are lines of silver and gold bells hung in front of the door way to prevent the groom to enter before he is allowed. The groom will be allowed to go inside only after he drinks with the bride’s relatives and answer customary questions such as “Where did you come from? What did you come here for? What did you bring with you?”. Actually, all of answers are prepared, and the groom just needs to remember them. The seniors of the two sides will talk together in a polite and friendly way and what the groom has to do is to drink and give some money to the door attendants. This money is not much, just like an entry fee that is already prepared for him. When the attendants are satisfied with the gift of money, they will let him step through. This activity is also very fun in Lao weddings. However, before that, he has to wash his feet by the bride’s younger sister or a female relative of the bride who is younger than she is. The groom has to give a little money to her to enter the house. On the other hand, the bride is taken to the pha khoun from her room by an elder female relative. She sits on the left of the groom, the parents and relatives sit nearby. During the process, the bride’s relatives and friends will push slightly her to lean on the groom unintentionally, and the groom’s side also does the same thing. It is believed to be the first touch of the couple that will be good for their married life in the future. Now, the baci or sou khuan ceremony begins. 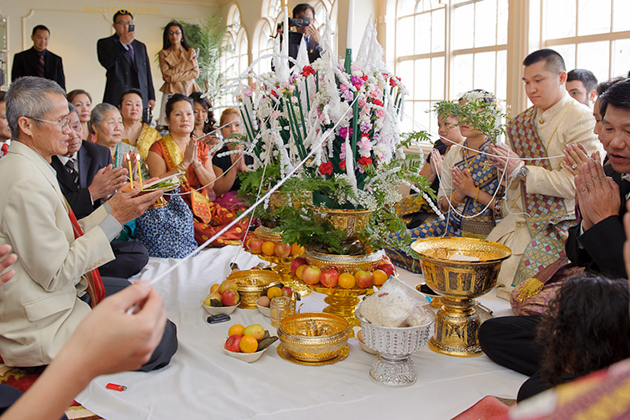 This includes the chanting of the master of ceremony (mor phon), the egg feeding and the tying of white strings on the wrists of the groom and the bride. At the end of the baci, the couple will do somma – a ritual of thanking of parents and relatives of both sides. This requires some small money gifts wrapped inside banana leaves, together with flowers and two candles. During the ritual, the elders will give the pair good wishes. The Laos wedding ceremony ends by sending the couple to their room. A senior will lead the groom to the room and the bride follows behind. Traditionally, the couple stays in the room until the next morning. However, over time, this ceremony has changed; it now takes place before the party for the pair to greet the guests. The guests eat, drink and dance in the party. 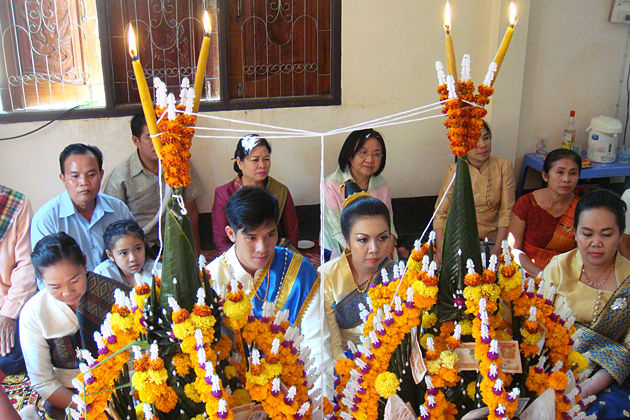 Today, Laotians prefer celebrate their weddings in two parts: a traditional Laos wedding and a modern Laos wedding party. Generally, Lao traditional marriage customs are a little bit different among regions Also, the traditional Laos wedding ceremony can be held in the morning or in the afternoon. Besides, only close friends and relatives are invited to the baci ceremony. The party can be held at a hotel or a restaurant in the evening. This is more common in cities; whereas, hill tribes have their own customs and traditions.